As the weather turns to mild and the evening falls a little bit earlier, my mind wanders to the joys of fall...all sweaters and boots, Brit folk and bonfires, apple butter and pumpkin pie. But for that Indian Summer that's bound to come before the true cold sets in, here's one last reminder of those dog days we've just left behind. Here in the Mid-Atlantic, berries are pretty much gone from the farmers' markets, but if you're lucky, you might be able to find a few stragglers of the fall crop at nearby pick-your-own farms. If not, though, stash this away in your recipe box until next year. 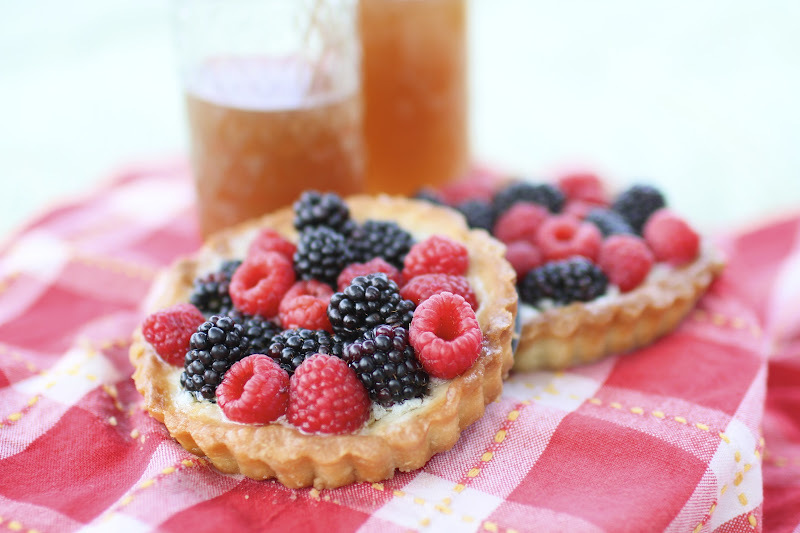 Though I've made several variations of these berry tarts and tartlets this summer, for markets and birthdays and going-aways, these particular treats were baked for that BYT Urban Picnic photo shoot back in August. This version, which is adapted from a Williams-Sonoma recipe and uses Dorie Greenspan's tart crust, is probably the most simple of the pastry cream (crème? )-'n'-berry pairings, calling for relatively inexpensive, staple ingredients. You can use any combination of seasonal berry and even throw in some other fruits if you like--kiwi, for instance, would be quite nice. 2. Roll out the dough and pat it into your greased and floured tart pans. Freeze the tart shells for about 30 minutes. Meanwhile, preheat the oven to 375 degrees F.
3. Bake the tart shells until they are golden in color, approximately 20-25 minutes. Let cool to room temperature while you prepare the tart filling. 1. In a medium bowl, whisk together the sugar, flour, cornstarch, lemon zest, and egg yolks until incorporated. The mixture will be thick and pale yellow in color. 2. In a saucepan, combine the milk and vanilla and simmer over medium heat, stirring occasionally. While continuing to stir, pour half of the milk into the sugar mixture until combined. Then pour this mixture back into the saucepan with the remaining milk and place over medium-low heat. Whisking constantly, cook the mixture until it becomes thick and begins to bubble, 1-2 minutes. Pour the pastry cream into a bowl and cover the surface with plastic wrap or parchment paper. Let cool to room temperature, then chill in the fridge for at least 1 hour. 3. Divide the pastry cream evenly into the 6 tartlet shells. Arrange the berries on top and dust with confectioner's sugar, if desired. Serve chilled or at room temperature. This shot had us driving out to one of DC's most beautiful spots--the Tidal Basin--frequented by tourists and neglected by locals. As we set up our picnic across the water from the Jefferson Memorial, passersby seemed confused by our focused attention on our food spread and disregard for the monuments. With fall setting in, the Tidal Basin would still be a lovely spot for a picnic--berry tarts or not--and you won't have to deal with the crowds of summer, though you may encounter a few Canadian geese, looking for a snack on their journey South. Labels: berry tart, berry tartlets, blackberry tart, raspberry tart, Washington D.C.